"Millennials in particular use snacking to ensure sustained energy to get through the day," says a Hartman Group researcher. 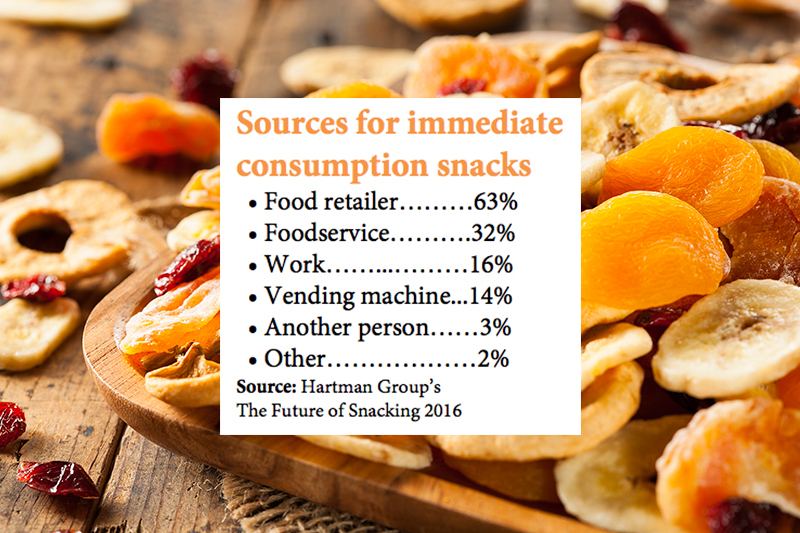 Hartman Group outlines three main drivers of snacking occasions, which tend to overlap. They are snacking for nourishment to help meet daily sustenance (56% of all snacking), snacking for optimization to help fulfill mental and physical performance (34%) and snacking for pleasure or to fulfill emotional desires for enjoyment, craving and comfort (49%). “Millennials in particular use snacking to ensure sustained energy to get through the day, and eat more snacks to help manage their appetite,” said Barnett. “They think of snacking as a strategy to maintain nourishment in a way that older cohorts may not.” Yogurts, granola bars, whole fruits and vegetables, water and smoothies tend to be consumed during an occasion where nourishment is among the goals, Barnett said. Snacking for optimization or to manage alertness and focus, which can include drinking a cup of coffee, also skews toward 20- and 30-something shoppers. “Across the board, due to active lifestyles, Millennials really make refueling and energy pick-me-ups important,” Barnett said. Snacking for pleasure, meanwhile, is implicit for a majority of eating occasions since people want to eat snacks that taste good. Americans are obtaining snacks from a number of places ranging from traditional grocery stores to online subscription services and even their workplace. Food retail is the source for 81% of snacking occasions, down 4 percentage points from 2012, according to Hartman Group. Meanwhile, 11% of snacking occasions are sourced from foodservice, up 4 percentage point versus 2012. Thirty-two percent of immediate consumption snacks are sourced from foodservice, up 11 percentage points since 2012. Another growing source of immediate consumption snacks is the workplace, up 10 percentage points to 16% versus five years ago. This would include food sourced from a work cafeteria or catering that’s been brought into the workplace.